You hear that every time you get on an airplane, but you may have also heard that expression in reference to motherhood and how important it is for you to take care of yourself as a mom. When you are well taken care of and healthy, your children and family will follow suit. It’s so easy to get caught up and put yourself last, but it’s very important to make YOU a priority. With the exception of a nasty bout with mastitis, I’ve been fortunate that my recovery after having Dylan has been relatively easy. We’ve been starting to get out and walk at the indoor track as part of our low-key, “keep the baby away from crowds” days, but I’m more than ready to get out and about, moving and back into a healthy routine! So you just had a baby and already feel the pressure to be bikini-ready before Spring Break. You’re not alone. There is so much pressure today for new moms to get back their pre-baby bodies within months after giving birth. For starters, I want you to take a deep breath and recognize the miracle that is your body and the life that it created. Seal in that gratitude and keep it in mind as you begin your post-baby fitness journey. 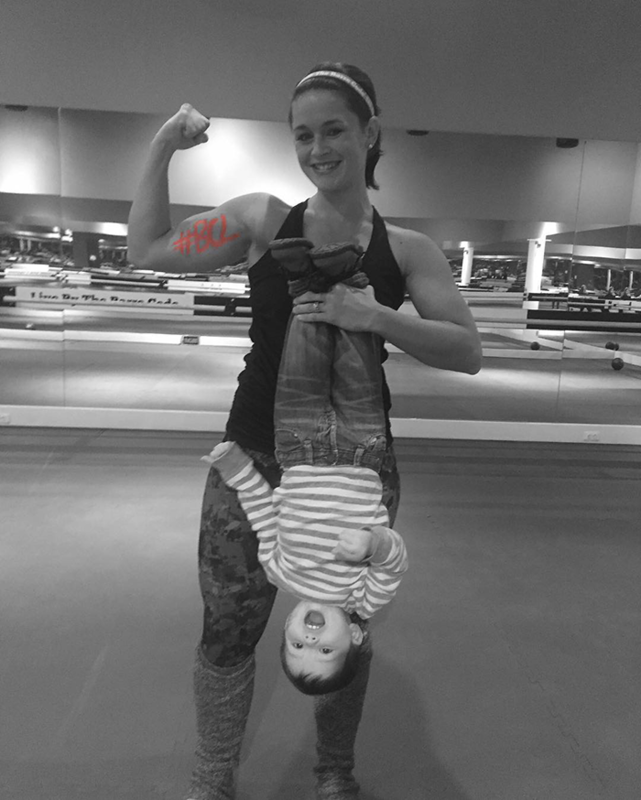 While there is no one-size-fits-all plan for every woman, I found the tips below instrumental in rebuilding my muscles and confidence after having my son. It took nine months for your baby to develop so it’s unrealistic to expect your pre-baby body to come back immediately. Make a list of smaller goals you want to accomplish with a timeline. Maybe you start by being active twice a week for the first month (after you’ve been medically cleared by your doctor) to resume exercise, and slowly increasing every couple months. That can mean talking your baby for walks (malls are great during the colder winter months) or doing a workout DVD in your basement while the baby naps; Two things I took advantage of myself! Don’t forget you’re likely carrying around an extra 10 lb. for several hours each day— use that time for upper body strength training by switching arms and add in squats or alternating lunges when he is strapped to you in the sling. Whatever you do, take your time getting back into it and be realistic about your goals. Hold yourself accountable to achieving them but don’t worry. A woman’s body is resilient. Trust in it’s ability to overcome the challenges you face and acknowledge and celebrate each success and milestone along the way. Life as you knew it will never be the same. Take a moment to let that set in and then decide how you can adjust your schedule to make room for fitness. Your time is precious so don’t feel that you have to dedicate several hours each day to working out— create a plan that works for you and your family. Maybe you can squeeze in 30 minutes at 5AM before anyone else is awake, or if your husband’s job is flexible he can come home early for you to head to your favorite group fitness class. Whatever works for you, go with it! Exercise can have such an amazing impact on not only your physical health but also your mental and emotional well-being. Be selfish. Allow yourself the well-deserved “me time” so that you can be the best mom you’re capable of being when you’re with your family. The biggest thing new moms worry about: the numbers on the scale. But… they’re just numbers! The scale does not dictate what kind of mother, wife, sister, friend, or daughter you are. Realistically – it isn’t even always an accurate indicator of health! Instead of focusing on what you have to lose, focus on what you have to gain: the firsts you will witness with your little one, the strength you’re developing on the inside and out, and the love that grows everyday. Don’t limit yourself from enjoying an occasional piece of pizza, glass of wine or cookie just because you haven’t “lost” the baby weight. Live in the moment. Join a gym where you find a sense of community, where all of the members genuinely support one another in search of each individual’s personal goals. I know it sounds crazy but that is one of the things I love most about The Barre Code. The only competition you have is with yourself. This takes the intimidation factor out fitness and instead allows you to lean on others when you need a little boost of motivation or inspiration. Surround yourself with people that have likeminded goals and values. Whether you get 20 minutes or an hour and a half, find something that you love to do and let nothing else get in the way of that well-deserved “me time.” Let your mind be present and hone in on you for the small chunk of your day— you have the rest of your evening to take care of the dishes, respond to your emails and prepare for tomorrow. After all, they tell you to secure your oxygen mask before assisting others– #AMIRIGHT?! If something’s not working, change it. Don’t get stuck in a rut and continue to question your actions. Be courageous enough to ask for help from family, friends or fitness professionals to get where you want to be. People genuinely want to see others succeed but are often too reluctant to be interject their opinions. Every mom you know has been in your shoes before and is a great resource in helping you achieve your goals. Health and fitness is not a one-size-fits-all lifestyle. Just like your pregnancy and labor/delivery were likely much different for you than your friend’s experience, your post-partum fitness journey may be, too. Find what works for you and don’t worry about what others are doing or have done. When you find something you enjoy, you’re consistent and patient, things will come together beautifully. Thank you to The Barre Code Metro Detroit for guest posting again! I hope you all love their features as much as I do. Be sure to keep up with the current class schedule here (and try a new class if you haven’t yet! ), and follow along on Facebook for events, news and more info on the opening of the Royal Oak studio!